Taken from Deal beach, late afternoon. I really like this. 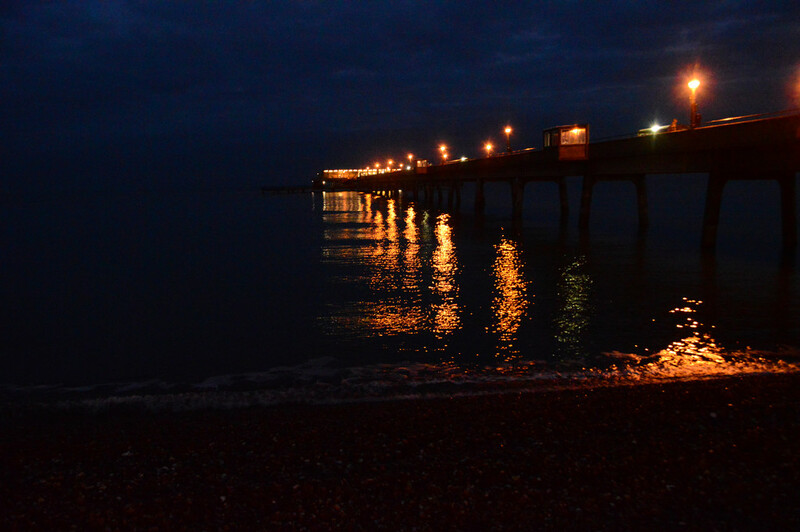 Deal Pier is not the most beautiful one, but by taking it in the dark, you've made a very dramatic picture of it. I really like this, too....taking a subject that has been done so much and making it unique with the lights and still retaining blue of late dusk...so well shot. Super light shot. I like the lights reflecting in the water. Wonderful night shot. I like the lights reflected across the water. Wow - beautiful on black and I like the tint of blue that shows in the sky. Fav. Nice reflections in the water. I like the bronzy tones. Super night scene, the reflections on the water are so beautiful. fabulous night shot, looks great on black! I love the shimmering reflections - looks really nice on black. Cool night capture, lights and reflections. Fab on black - love the inky sky and reflections. Gorgeous lighting and reflection in this night scene.